Biblical Productions has successfully provided production services in Israel for international film crews and leading TV networks from around the globe for many years. International production teams arrive throughout the entire year to shoot feature films, documentaries and commercials in the Holy Land and for good reason; the country offers spectacular landscapes, monumental architecture and a variety of cultures and ancient history. But filming in a foreign country, and especially in the Middle East, can be challenging and complicated when one is not familiar with the culture, the language, the security regulations, and the sensitivity of the religious locations. For Biblical Productions, providing comprehensive production services in Israel means helping the foreign crew meet the challenges involved in a production in a foreign country every step of the way. During pre-production, our production service team scouts and secures the best film locations in Israel, arranges film permits in Israel, liaises with security personnel and tracks the perfect interview experts for your production. Due to our extensive knowledge of the country and filming sites, Biblical Productions can arrange the best schedule for your shoot in Israel. We will coordinate your entire shoot and take care of all logistics, i.e. arranging adequate transport and drivers, as well as finding suitable hotels and guesthouses for your stay. 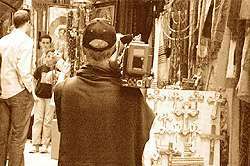 Biblical Productions can hire a top professional local film crew in Israel to support your production if needed, as well as top of the line film equipment in Israel. We have a respected list of professional DPs, soundmen, assistant cameramen, gaffers and grips who have many years of experience with high-profile national and international projects. For many years, we have been working with one of the biggest equipment houses in the country and so we manage to secure equipment at the best quality for great prices as part of our production services in Israel. Having a production base far away from your own production house is a worthwhile investment that allows the production team to truly focus on their creative work when filming in Israel. As a company specializing in production services in Israel, our goal is to ensure a smooth production and the best footage possible for your film. We are fully aware of the responsibilities that come with production services, and so we take the time to understand our client’s creative vision and needs, as well as caring for their absolute safety and security. Providing successful production services does not end with the last day of shooting. Our professional and reliable production service team takes care of additional arrangements after the shoot is completed, i.e. finding more archival footage, acquiring additional release forms, sending thank you notes and much more. Biblical Productions has been offering production services for a wide range of international clients and TV networks such as the History Channel, Channel 4, PBS, ARTE, ZDF and National Geographic. We invite you to look at our letters of recommendation, which satisfied clients have sent us over the years. Biblical Productions has provided production services in Israel for feature films, TV documentaries and series, TV commercials and music clips. Whichever format your anticipated production in Israel might have, Biblical Productions is able to deliver the best production services for you in Israel.